Welcome to the Michigan Tech Experience Tech initiative. Browse through the categories to access the most up-to-date information. This fee complements the Student Activity Fee and provides students the opportunity to experience much more of Michigan Tech. Students have access to regularly scheduled theatre; jazz, orchestra, wind symphony, pep band and choir performances; cross-country and downhill skiing; hockey games; art gallery showings; snowboarding; year-round tennis; golfing at Portage Lake Golf Course; and Intramural sports. If you have more questions, see the Frequently Asked Questions page or feel free to mail experiencetech@mtu.edu. Thank you for visiting! What can you Experience at Michigan Tech? 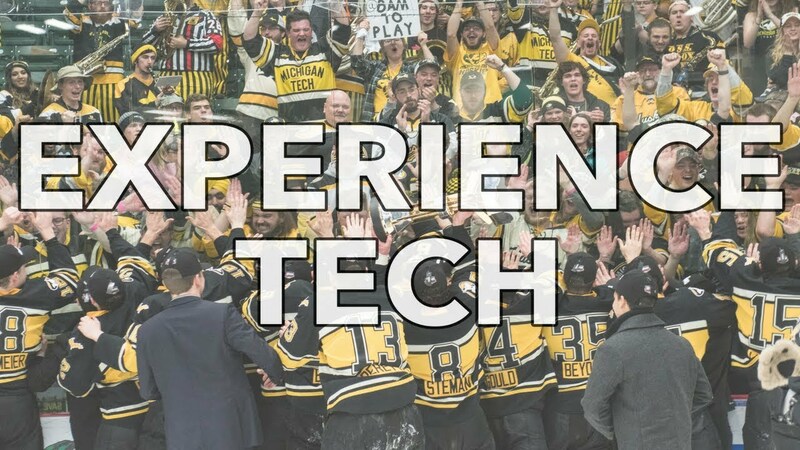 Video detailing the Experience Tech program on Michigan Tech's campus. See the Graduate Student Government Program Review—Fall 2013. Mont Ripley is highly favored among Michigan Tech students. During the 2007-2008 season students purchased more than 925 season passes and upwards of 3,000 daily passes. With recent additions, such as the Copper Hoist chair lift and several new snow guns, skiing and snowboarding at Ripley is at its best. So go ahead, tear up the slopes. If you have never skied or snowboarded and would like instruction, Michigan Tech offers several physical education courses where beginners and the experienced can receive weekly lessons. The fee includes access to Mont Ripley ski hill (when there's snow on the ground of course) and one 50-percent discount on ski or snowboard daily rental package. The hill can safely support 1,000 users at a given time, and to make sure that we are within that limit students are required to sign in (tap your Michigan Tech ID card) at the chalet before hitting the slopes. At that time you will be given a day pass, which means that every time you want to use the hill you must visit the chalet to get a pass. Visit the Mont Ripley website for more information. Check out the Welcome to Mont Ripley video. Come and play tennis at the newly renovated Gates Tennis Center! Enjoy a set or two on the recently resurfaced indoor courts—with more than 1,000 court hours available each month, playing tennis year-round has never been this easy. Your fee also covers one-hour non-student court rental. Just call 906-487-2774 to make a reservation. Bring your non-marking tennis shoes or purchase a pair at the desk! Simply bring your valid Tech ID and the attendant will point you to your court. For additional information on hours, rental rates, and reservation policies please see the Gates Tennis Center website. Dust off your clubs, it's time to go golfing. The course usually opens around the May 1 and stays open into October. If you have always wanted to golf but never got around to it, or if you want instruction to improve your swing, Michigan Tech offers several Physical Education courses ranging from the beginner up to advanced players. Student rental clubs available for $5. For information about proper golf etiquette, please visit the USGA website. Visit this website or call 906-487-2641 to book your tee time and don't forget to bring your Tech ID with you. Please see the official Portage Lake Golf Course website for further details on rates, location, course information, and policies. A block of 750 seats available in sections J - O are held for Experience Tech students. Your valid Michigan Tech ID will gain you access to the John MacInnes Ice Arena student entrance (northwest corner of arena near the double doors leading to Portage Health) one hour prior to each home hockey game. Seats are available on a first come first serve basis. Your valid Michigan Tech ID will gain you access to the John MacInnes Ice arena student entrance one hour prior to each home hockey game. Seats are first come first serve in pre-designated sections marked Experience Tech Seats. If a student would like to sit next to a friend, it is best for both the student and friend to enter the ice arena at the same time. What if all 750 E.T. Seats are Claimed? In the past, when the block of 750 reserved Experience Tech hockey seats ran out, those still wanting to purchase a student hockey ticket were charged up to $12. However, the Athletic Department is continuing to offer $5 student tickets for the 2018-19 regular season as a carry over from the previous seasons. As long as reserved seating is still available on the student half (North side) of the arena, you will receive a reserved seat for $5 after Experience Tech tickets are gone. Once reserved seating is sold out, you will receive a standing room ticket until those are sold out at which time all ticket sales stop per fire code. Regardless of whether the seat you pick is an Experience Tech seat or a purchased $5 student ticket, you will be required to show your valid student Michigan Tech ID at the time you pick up your ticket, and at the entrance on game night. Michigan Tech Students can still purchase season tickets if they would like to be guaranteed the same seat location for every home game. The Intramural-Sports program has been an integral part of the Michigan Tech experience since the early 1970s. Over the years we have offered a variety of recreational activities for the Michigan Tech student body. We continue to improve and expand our recreational services and facilities. We strive to be innovative and creative in satisfying the recreational needs of the student body. Due to restriction of ice time, ice hockey will be restricted to 50 teams (there were 29 teams in 2011). A deposit is required to help reduce forfeits (please see Deposit/Forfeit Policy below). Because the true purpose of intramurals is participation, forfeits cannot be tolerated. Team managers are responsible for providing enough players for their team so forfeits do not occur. If extra players are needed, a list is available on our website, IMleagues.com/MTU, of individuals who are seeking to be on a team. The IM office must be contacted as soon as possible if a team is forced to forfeit a game. The only sport to be charged a prepaid forfeit fee will be ice hockey. The charge will be $150. This fee must be paid when the team manager registers their team. The full amount will be refunded if the team does not forfeit any games. The charge for a forfeit in ice hockey is $75. Forfeit fees are to be picked up at the Central Ticket Office at the conclusion of the season. Team managers will be emailed the information on collecting the fee. For all other Intramural leagues (three-or-five game round robin tournament), teams who forfeit a game will be charged $10. The supervisor will fill out a form that a forfeit has occurred and put it in the folder with the score sheets. The Intramural Office will contact (email or phone) the team manager the following day. A designated team member must come up to the Central Ticket Office where they will pay. If the fee is not paid by the designated time the team will be dropped from the league and not participate in any IM sports until their fee is paid. 1st forfeit: $10 to remain in the league. 2nd forfeit: Dropped from the league. Must pay the $10 to play in any other IM sports. Paying the fee does not cancel the forfeit. It is still a forfeit. Two forfeits and the team is dropped from league play and playoffs. Deadline to Pay Tuesday @ 3 p.m. Wednesday @ 3 p.m. Thursday @ 3 p.m. Friday @ 3 p.m. Monday @ 3 p.m. Monday @ 3 p.m. Monday @ 3 p.m.
Game time is forfeit time! At game time the clock timing the contest will be started. At this time, the offended team is given the option to take the victory or wait up to 10 minutes for the other team and play the game. Once the decision is made by the offended captain, it may not be reversed and the outcome of the contest will stand. Any time consumed by waiting for a team shall be taken off the time allotted for the game. In the event that neither team is ready to play at the designated starting time, a double forfeit will be declared. Visit the Intramurals-Recreational Sports Services website for more information. Michigan Tech, located in Houghton in the Upper Peninsula of Michigan on the Keweenaw Peninsula, is a prime location for outdoor adventure, and the OAP wants to get you outside and active! The Outdoor Adventure Program is funded by the Experience Tech fee. We help connect students to the outdoors through guided trips, leadership training, information sessions, equipment rental, and by working closely with student organizations to help advertise and program events. We have been busy working hard to bring students excellent outdoor opportunities. Each person who has paid the Experience Tech fee also gets a one-day snowshoe rental. You must visit OAP in person with your Tech ID to take advantage of the offer. You can also get access to Nordic ski equipment rental for the Recreational Trails. Visit www.oap.mtu.edu for more information. Michigan Tech students enjoy admission at no additional cost to premier national and international touring arts and educational programming included in the Rozsa Presenting Series. Students simply present their valid Michigan Tech ID card at the ticket office, where they are able to choose their seats. Each student is allowed one guest. The Michigan Tech trail system accommodates all levels of classic and skate skiers, mountain bikers, snow bikers, snowshoers, walkers, hikers and runners—from beginner to the advanced user. The trails are available to Michigan Tech students with a valid Tech ID. Sense what it's like riding through our University's trail system on a mountain bike. Check out what the trails are like in the winter. Admission to Visual and Performing Arts performances are a part of the Experience Tech program. One non-student admission to each Visual and Performing Arts Performance (approximately 28 per year) is also included. Events take place both at the Rozsa Center and the McArdle Theatre. Please present your valid Michigan Tech Student ID at the performance hall entrance to be scanned. You and one guest will be admitted. You don't have to stand in line at the box office, and paper tickets are no longer needed for Department of Visual and Performing Arts Experience Tech seats. For more information contact ticketing at 906-487-2073 or email tickets@mtu.edu. You can also visit the Visual and Performing Arts website or Rozsa website for more information. Student Health and Wellness programming is partially paid for by the Experience Tech Fee and covers the areas of Sexual Health, Mental Health, Personal Wellness, Alcohol & Other Drugs and Food Insecurities. The Student Health and Wellness program offers resources and workshops to assist students with achieving and attaining a balanced lifestyle during their years at Michigan Tech and the years that follow graduation. Visit the Wellness website for more information.